Engility has partnered with the nonprofit Center for Cyber Safety and Education to introduce a scholarship program designed to help U.S. military veterans obtain cybersecurity training and certification. The CyberWarrior program is open to service members who will be discharged from any of the country’s five military branches by Dec. 21 as well as active members of the National Guard and Reserve units, Engility said Monday. 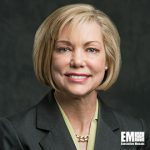 “Our global security relies on having a pipeline of highly skilled, dedicated cyber experts to ensure that our country is prepared as we move into the future,” said Engility CEO Lynn Dugle, an inductee into Executive Mosaic‘s Wash100 for 2017. The company seeks to help veterans who complete the training to secure cybersecurity-related positions in the private sector. Scholarships will be awarded in December and cover training classes, textbooks, materials and exam vouchers for selected (ISC)2 certifications. Interested applicants can apply for the scholarship through Nov. 30.